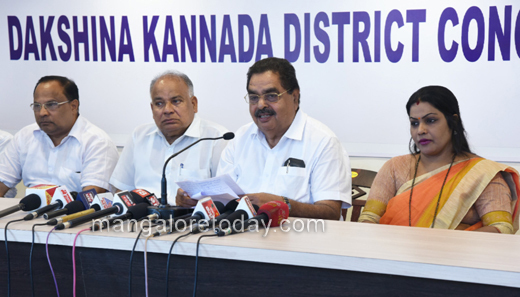 Mangalore, Oct 9, 2017 : BJP President Amit Shah’s visit to Mangaluru was cancelled as the party has no hopes of putting up a good show in the district in the upcoming elections, alleged DK District in-charge Minister B Ramanatha Rai. Addressing press persons at the Congress office here on October 9, Monday, Rai was also critical of Uttar Pradesh Chief Minister Yogi Adityanath’s recent visit to Mangaluru. Referring to the recent Gorakhpur tragedy as well as the poor law and order scenario in Uttar Pradesh, Rai said a leader who has failed to deliver in his own state, has come with advices to others here. Dakshina Kannada MP Nalin Kumar’s allegation that the menace of drugs mafia has seen a rise under the Congress rule, also drew sharp comments from Rai. The drugs mafia existed even in the past when there was the BJP government, he said adding a special team would be constituted to tackle the menace. Lashing out at the BJP and blaming it for the spurt in communal incidents, Rai recalled how the Karthik Raj murder case was given political colour by the BJP. He even alleged that the BJP men were moving around with the Vinayak Baliga murder accused and said they should be ashamed for their act. On the sand shortage issue, the Minister said the probe would be solved soon as license will be granted for sand extraction in CRZ and non-CRZ areas. Mayor Kavitha Sanil, District Youth Congress President Mithun Rai, former mayor Shashidhar Hegde, Ibrahim Kodijal were present among others.